Calorie counting is an old, simple idea: count the exact numbers of calories you eat to stay healthier and lean. When counting macros, or macronutrients, you keep track of the exact grams of carbohydrates, fats and proteins in your daily caloric intake. Because calories are made of macronutrients, macro counting includes calorie counting. The basic idea is that not every calorie is equal. Your body uses fat, protein and carbohydrates differently. Carbohydrates are an irreplaceable source of energy – our main source. But many of us get too many carbs compared to our activity level. When your body is at rest, it prefers fat for fuel. During higher-energy periods, the body switches to carbohydrates. So, when counting macros, work-out days would include more carbohydrates and protein, and some fat. On rest days, you would eat a higher fat and protein to carb ratio. Protein is the most essential macronutrient. It builds muscle and prevents muscle loss., while helping keep you feel full for longer periods of time than carbohydrates. Fats are important and not something to avoid. Healthy fats balance our hormone levels and feed our brains. In fact, the brain is largely made up of healthy fats. Of course, you should avoid trans-fats, and stick with fats from sources such as fish, beans, coconut oil, nuts and avocados. Since our bodies don’t make essential fatty acids, we can receive those nutrients through nuts and fish. A good-quality fish-oil supplement can also help us maintain the proper level of Omega-3s. 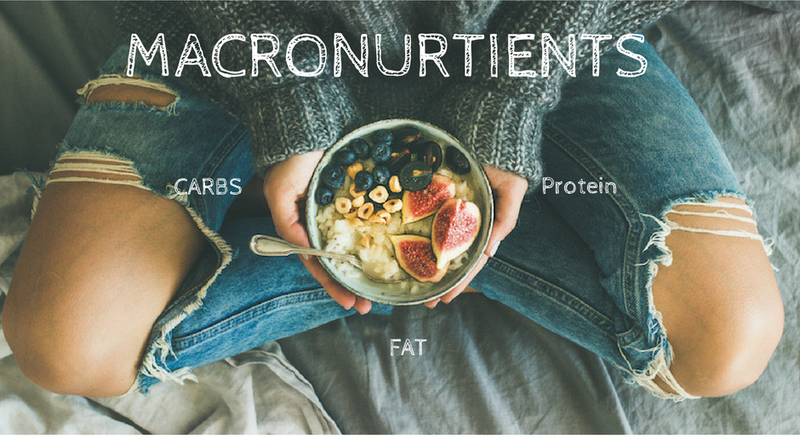 Obviously, counting macronutrients won’t benefit you the same if you choose to eat processed or high-sugar foods. Your diet needs to consist primarily of wholesome food, so you’re taking in plenty of micronutrients: the vitamins and minerals found in fruits and vegetables; high protein sources such as fish, meat and nuts; and fiber from whole grains and oats. Macro counting does allow for special treats. If you are paying attention to your calories and macro balance, you can eat chocolate, have an alcoholic drink or whatever delicious food or beverage is calling to you. But it’s helpful to your goals if you exercise on the days when you eat these treats. To find your ideal macro rations, you can use an online calculator suited to your particular goals, a nutritionist or a book on macros. As you aim for your specific macro ratio, you should adjust it based on what’s happening with your body. A macro ratio of 50 percent carbohydrates, 25 percent protein and 25 percent fat is common. One gram of carbohydrates contains four calories; one gram of fat, nine calories; and one gram of protein contains four calories. A calculator can also be helpful. Of course, if your food is labeled, counting macros and calories is easier. But hopefully you are eating many whole foods, so you will need to deduce for yourself. That’s where the calorie counting book can come in, and you can also use an online resource for nutritional data ( Myfitnesspal App). Using either your phone or a simple notepad, you’ll keep track of the macros and calories for everything you eat or drink and calculate the ratios at the end of each day. And remember, your needs can vary based on metabolism and activity level. If you find that you are hungry all the time, you might need to change your macro ratio to something that works better for your body. Be sure the number of calories you’re eating is also within the proper range for your healthy eating goal. To learn even more about how calories from different foods function in your body, read Jonathan Bailor’s The Calorie Myth.